Enjoy. Hang loose. Feel. Let it flow. Style. Impress. Share emotions. Fly. Live. Follow your instinct. Inspire. Touch. Jump. Reach. Laugh. Keep on moving. Progress. Be fascinated. Be excited. Smile. Love. Be chic. Relax. Be conscious. Reflect. Lose it. Motivate. Feel the sunshine. Celebrate. Surf. Be. It's the enigmatic and private reverie we all conceal in the back of our minds that someday we'll wake up in a resplendent coastal town, our face lovingly brushed by a morning sunbeam, and our senses gently awakened by a light gust of wind from the Mediterranean. The dream is real, rise and shine! Put your best shoes on, we are about to embark on an itinerary made up of a labyrinth of ancient lanes, noteworthy architectural landmarks, rich Genoese dishes, old fishing villages, Europe's second-largest aquarium, UNESCO World Heritage museums, picture-postcard treks, and a fragrance of local life in the land of commerce and navigators. Come sail away! If you're traveling with kids, they'll love the Pirates of the Caribbean-style ship called Galeone Neptune. A glimpse into the essence of real Genovese pirates! It rains a lot here from October to November, therefore try to avoid this period if you wish to maximize your experience. Genoa has a fast ferryboat line, connecting the center to the western part of the city in under 30 minutes. It's called Navebus and gives you a unique perspective of the city. On Mondays, most restaurants, museums, and touristy places are closed. Plan ahead carefully, as you wouldn't want to miss a day here! The illustrious Christopher Columbus was a citizen of Genoa. 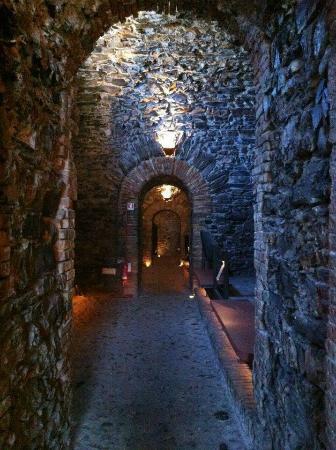 You can visit his house close to the best known ancient gate called Porta Soprana. 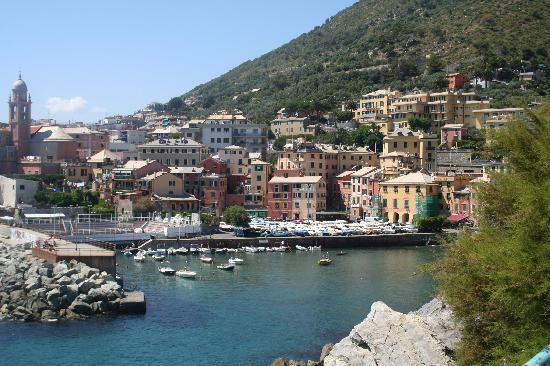 Genoa is the ideal starting point to delve into the picturesque villages on the Italian Riviera — the Cinque Terre area is just heaven on earth! Liguria is famous for its focaccia and there are many places in Genoa to taste this delicious pizza-like pastry. Don't think twice, you won't find better focaccia anywhere else! Pesto, a sauce made from basil and eaten with pasta, was born here. The basil plant does not have the same conditions for growth in other regions, so eat the finest here. 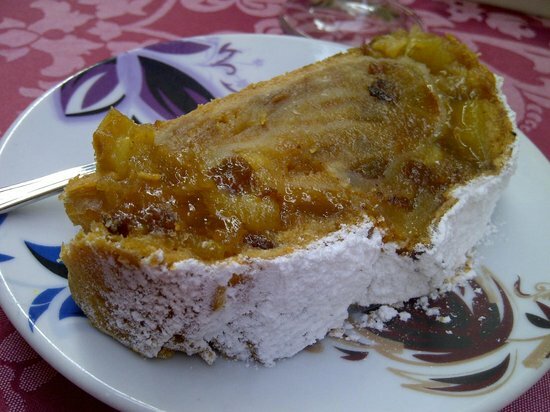 The pànera is a typical semi-frozen dessert containing coffee that is adored by the Genoese people. They even eat it in winter! Kick off your trip in the buoyant and stimulating heart of the city. 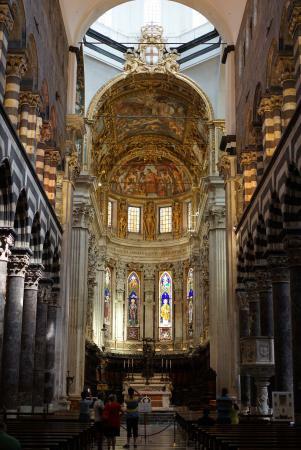 After years of abandonment and carelessness, Genoa's old quarter is once again the nucleus of the city, boasting a massive number of sites declared by UNESCO as part of World Heritage. 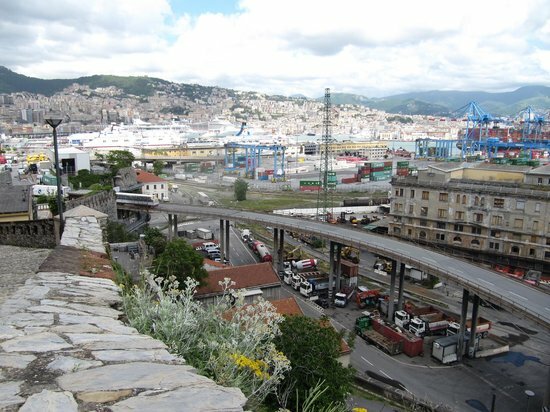 It lies between the Carignano hill in the eastern part of the city and the train station of Porta Principe, just behind the port. Entrenched in the architecture and aesthetics of the timeworn passageways lies a charisma matched only by a few other Italian boroughs. Numbers on the houses are either red or black: black means private house or the main entrance, red means secondary entrance or a shop. 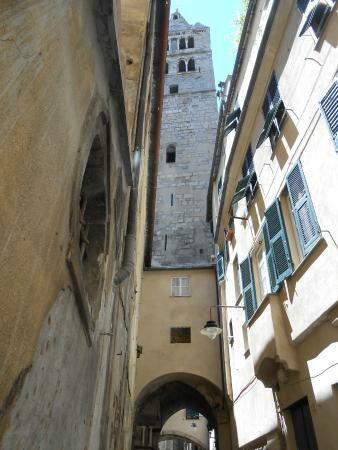 Wander along the narrow medieval alleys called 'caruggi' and 'crêuze.' What a delightful way to get lost! Via Canneto il Lungo is probably the most famous and utterly characteristic street in the old quarter. It's slightly inclined towards the port and denotes local charm at 100%. This is one medieval neighborhood with one of the highest population densities in the world. Expect to mingle with locals rather excessively! 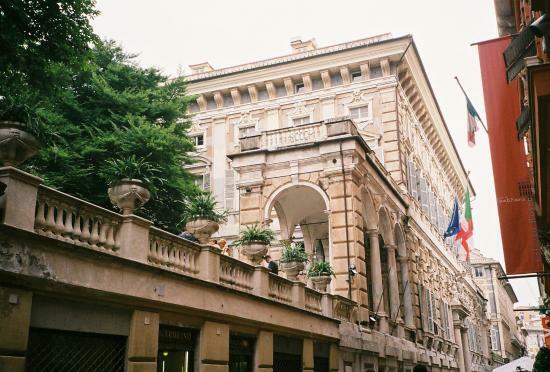 Genoa's most extravagant street, and historically the residential district of the Genoese aristocracy, Via Garibaldi is a timeless display of 16th century residences and mansions, UNESCO World Heritage Sites, open staircases, and patios dominating lavish gardens. Once named the 'golden street' and also 'strada nuova,' this 250-meter long avenue is also known by art lovers for being the most iconic museum artery in town. Start your visit from the Fontane Marose square and go towards Piazza della Meridiana. 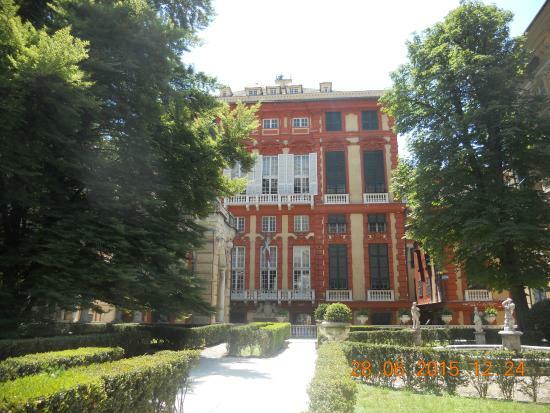 In the courtyard of Palazzo Rosso and also in the pensile gardens of Palazzo Doria Tursi, concerts and theatrical performances are periodically held. You could be in luck! The terrace of the Palazzo Rosso is a great spot to take some swell photos! 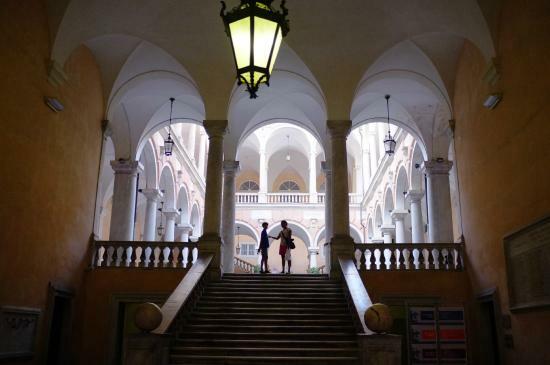 The Genoa Museum Card grants you free access to 21 museums. The Museums + Bus Card adds free public transportation. Validity is 24 or 48 hours. 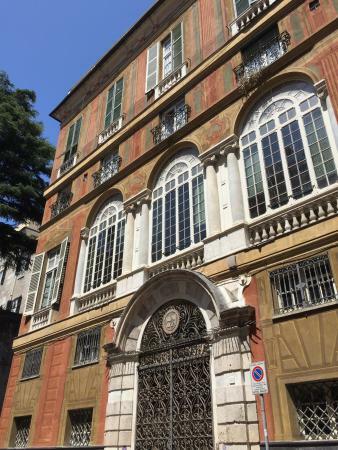 Palazzo Doria Tursi holds many of the the valuables of violinist Niccolò Paganini. Find number 4 (the Chamber of Commerce) and go to the first floor: this is the Golden Gallery, a visual feast for rococo lovers, a superb display of frescoes and wealthy ornaments. A superb display of 114 palaces — of which 42 have been entered into the UNESCO World Heritage Sites list in 2006 — this exquisite ensemble was built by the Genoese nobility and used to accommodate people of high rank visiting the city in the period of the Maritime Republic. 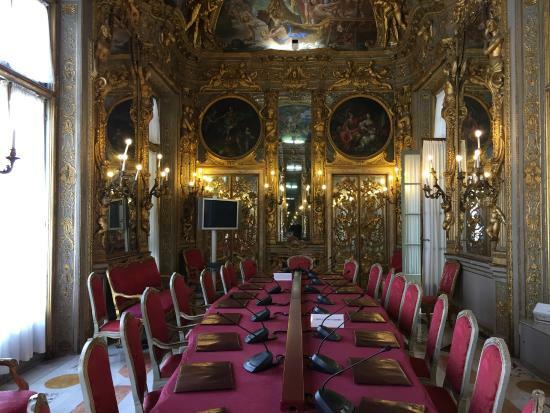 There are many places of interest to visit such as Palazzo Doria Spinola and The Ducal Palace, both of which are splendid examples of noble architecture. Along the way there are many spots, where you can taste typical dishes of Genoa, and bars, cafes, clubs, and shops dot the streets. The full circuit can be seen only during the Rolli Days in the months of May and June. Private visits can also be organized in other months. 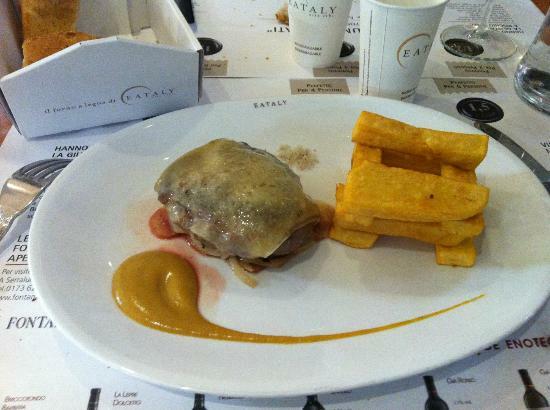 After all the art immersion of the first part of your day, you'll probably fancy some refreshments and a savory snack. 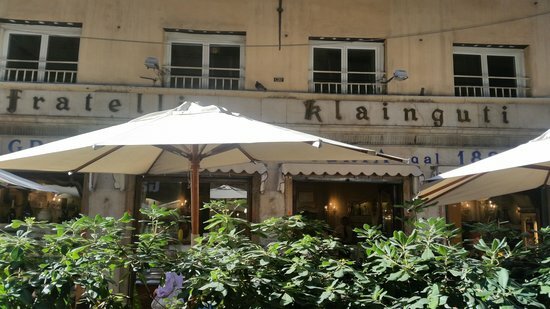 In Genoa there is a first-rate bakery on almost every corner, and Fratelli Klainguti is an institution among these. We are very close to the old port area, once visited by crowds before boarding their ships, which is used today mainly for strolling and entertainment purposes. Nevertheless, among all the back and forth of the masses and ubiquitous colorful shops, it's almost impossible not to notice this place: massive, elegant windows, crystal chandeliers, and the charm of 1828 perpetuated generation after generation. This was Giuseppe Verdi's favorite place. There is a note on the wall inside with his original handwriting. 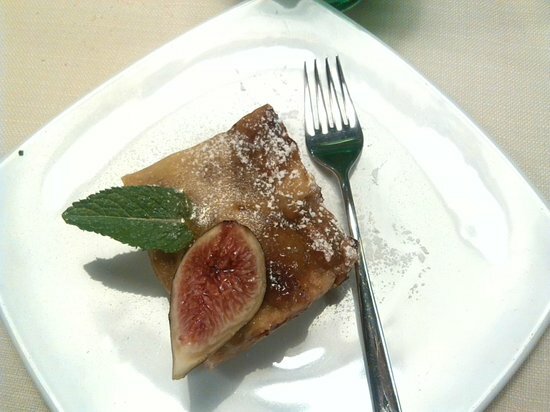 The Falstaff brioche was Verdi's favorite — it has a hazelnut filling and melts in your mouth. Perfect with coffee! 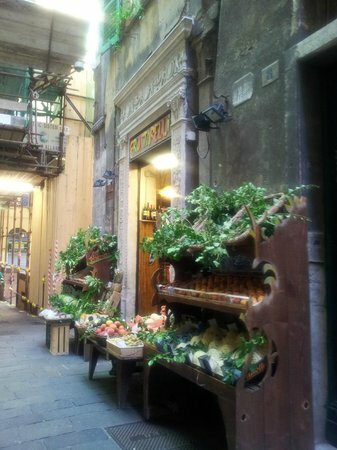 Every bakery in Genoa has its own specialty. Here it's the Torta Zena that's been making history for some time now. I can't leave without ordering one! 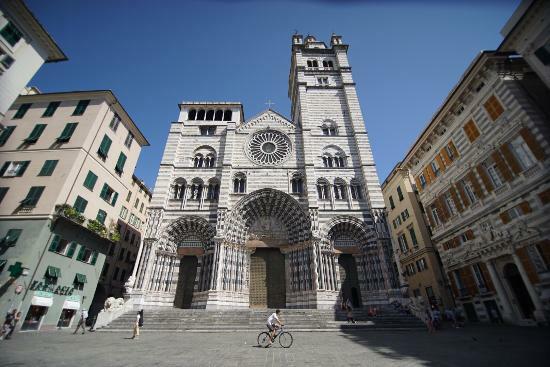 The bird-eye view over the elderly heart of 'La Superba' (Genoa was labeled as such by Petrarca) is yours to enjoy once up on the observation deck. Castelletto is a residential neighborhood located on the hills, which takes its name from a fort that dominated the center of the city until its demolition in the second half of the 19th century. Also known as the 'Belvedere Luigi Montaldo,' it boasts 360 degree views of the old port, the palaces of Via Garibaldi (the old Strada Nuova,) the promontory of Portofino in the east, up to the foothills of the Italian-French border of Ventimiglia. People often come here to take wedding photos. If you come at dusk you are guaranteed to have the best shots of your holiday in Italy. 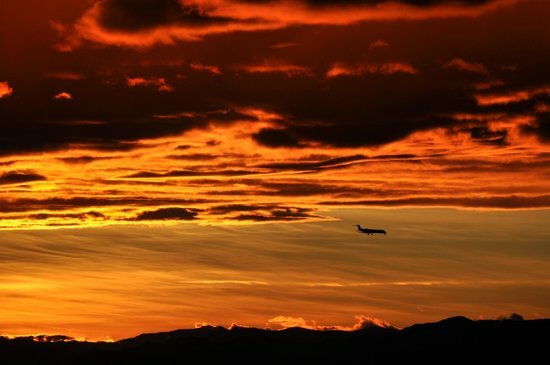 There's no other sunset like this! The esplanade can be reached by a lift from Piazza Portello near Via Garibaldi, or by taking the vertical and quite narrow streets that lead up to it. 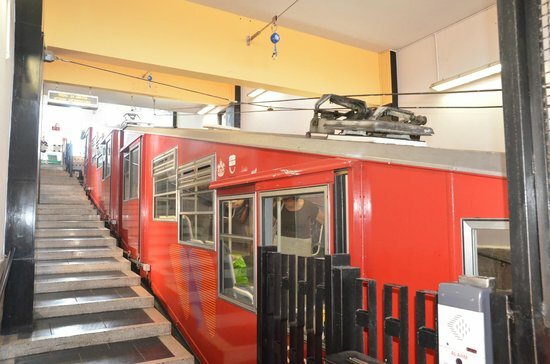 The elevator has undergone various conservation and improvement works, which is what the photo exhibition at the departure station is all about. The ticket for the lift can now also be purchased via SMS. The antique tradition of cooking with simple essences and natural aromas has not been forgotten for a single moment in beautiful Liguria. Just 20 meters away from the acclaimed Piazza de Ferrari, the Rosmarino specializes in seafood cuisine and offers traditional dishes presented in a fashionable and clear-cut manner. One of the rooms has an open kitchen, while the precise and discreet staff describes the dishes and offers suggestions and advice. You must absolutely taste one of the most famous Ligurian pasta recipes: 'trofie al pesto.' It is a simple dish but the high-quality ingredients make it outstanding. The menu is written on a big blackboard but there's always more to it! Just ask the highly cordial staff. 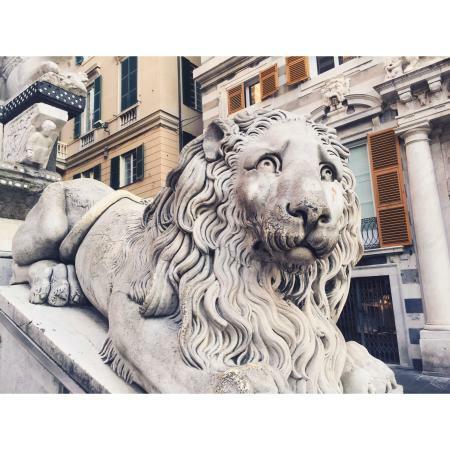 Alternating black and white layers and two friendly lions emerging from the sides will let you know that you have arrived in front of Genoa's Cathedral, located in San Lorenzo square. 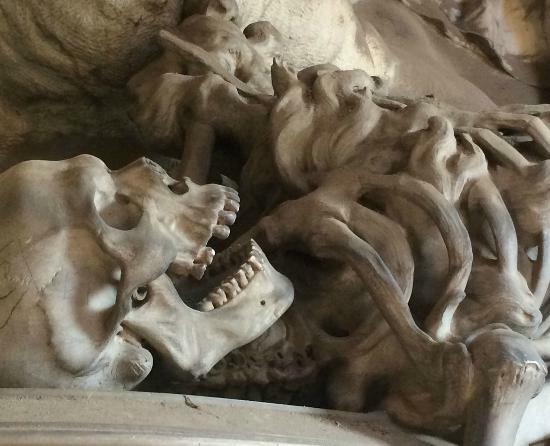 A quick analysis will reveal a conglomerate of different styles — the fanciful Gothic carvings will thrill you, while the 14th century frescoes in the Byzantine style from inside the church will intrigue you. Moreover, parts of the original building dating back to the 12th century blend with newfangled 20th century cement chunks. The Museum of the Treasury lies in the underground rooms of the cathedral and displays various religious objects, among which the supposedly Holy Grail used by Christ Himself during the Last Supper. You may notice one of the towers does not have a bell. It's possible to climb up there and observe the roofs that beautify the old town. 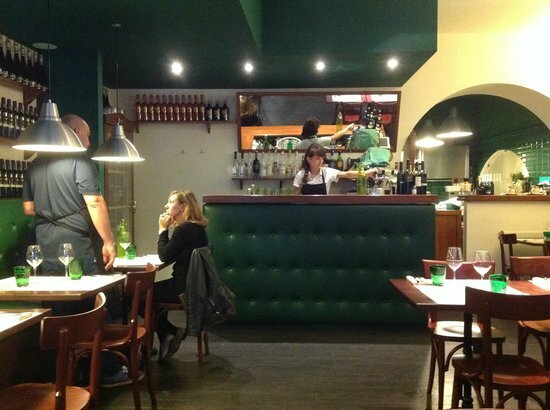 On Via San Lorenzo, you will spot the Focacceria San Lorenzo. The best focaccia in the world is in Genoa and this bakery makes Genoa proud. Follow the San Lorenzo street until the Church of Jesus and you will arrive in Piazza de Ferrari, the most prominent square in Genoa. Beyond this point, the modern city prevails. During World War II a bomb dropped through the roof of the cathedral but somehow didn't detonate (divine protection some would say!) The unexploded missile is displayed inside. The church is closed from 12pm until 3pm. However, with so many nearby places just waiting to be discovered, you won't have any time to waste. You may visit the cathedral for free, but for the Museum of the Treasury you have to purchase a ticket. 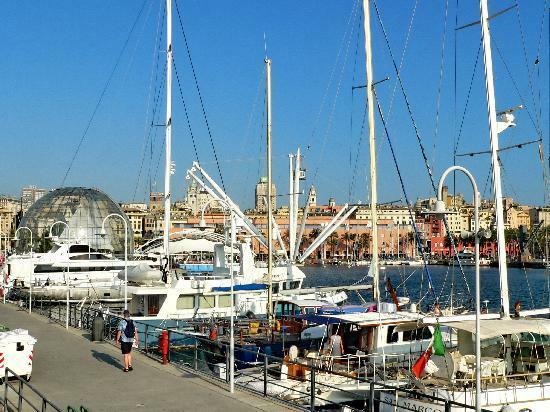 As a tourist in today's Genoa's Porto Antico, you are just spoiled for choice. In 1992, to celebrate the 500th anniversary of Columbus's discovery of America, and with the help of the brilliant mind of the world-renowned Genoese architect Renzo Piano (also responsible for Paris' Pompidou Center,) the old port of Genoa was born afresh. The tourism renaissance that followed is rightfully justified, as the old port hosts a considerable number of attractions in Genoa today. A visit to the Biosfera is a must! The glass and steel structure imitates inside a typical tropical environment, plants and animals included. If you feel the need for a breath of fresh and somewhat cooler air, head to the nearby National Museum of Antarctica, also a center of national and international research. Don't miss the Bigo while you're here! A panoramic lift that will take you to dizzying heights and spin you 360 degrees. A thrilling and fun way to see the city from above! Your kids will love the Città dei Bambini (City of Children,) Italy's largest playground (science and technology oriented) for children between 2 and 12. Lots of bars and restaurants with alluring seafront views are waiting in the old port. Once again, you'll be just spoiled for choice! Buy the combined ticket for the aquarium, the Biosfera, the sea museum (Galata,) and the Bigo — it's cheaper than getting them separately. 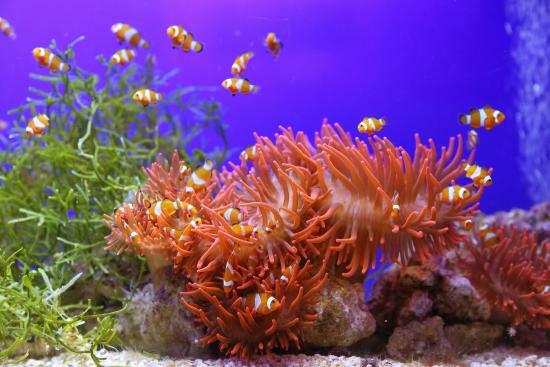 Conveniently situated in the very touristy area of the old port of Genoa, the aquarium was inaugurated in 1992 and has since become the town's leading attraction. Italy's biggest aquatic museum and the second largest in Europe invites you to dive into (not literally!) 70 different eco-systems, and stand in awe in front of sharks, jellyfish, seals, penguins, dolphins, piranha, turtles, and many more. 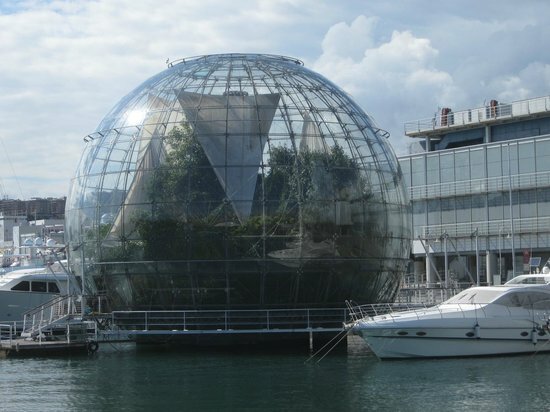 Check out the cetaceans pavilion, a structure designed by the famous architect Renzo Piano. 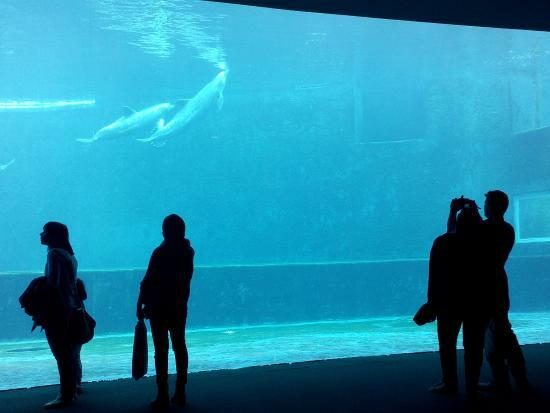 Once in the cetaceans pavilion you can admire those beautiful creatures in two ways: either from an underwater perspective or from above the exhibitive tank. 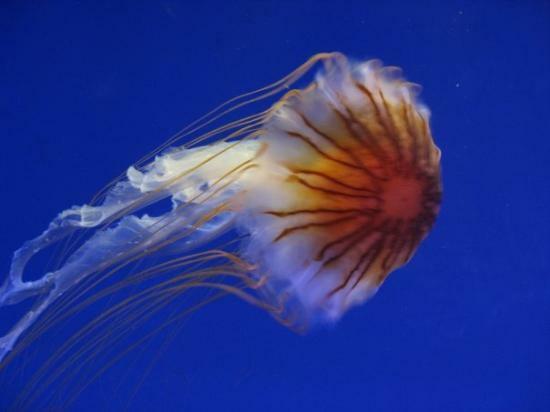 It's possible to buy a combined ticket for the aquarium and the splendid Palazzo del Principe. This itinerary can be done via boat, leaving from here and docking on the other side. There is a bus line, a subway stop, and even a train station nearby. No excuses not to reach this magnificent landmark! The visit takes quite some time... Be prepared to spend about two and a half hours inside for a complete tour. The venerable dignified lady stands in the heart of Genoa's harbor. 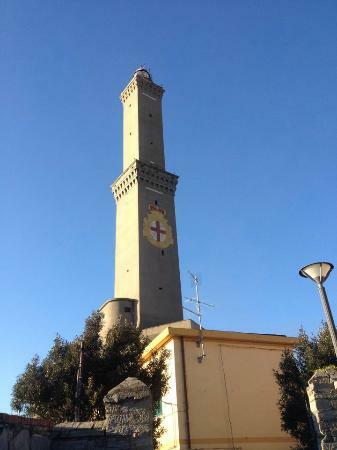 A conspicuous sea-mark since it was rebuilt in 1543, Genoa's lighthouse is almost 120 meters above sea level and relishes the title of 'the city's symbol.' In ancient times, apart from its purpose of signaling the position of the port to incoming ships, it also served as a defensive fortress outside the city walls. Pay a visit to the adjacent museum. Various items that depict the history of the port and its navigation are waiting to be admired and appreciated. The view from the pinnacle is worth the climb: sea, sky, and land merge in a unique perspective. In summer it's possible to take a boat from near the aquarium in the old port and visit the lighthouse, among other landmarks. The ride takes a little over an hour. This is the tallest lighthouse in the Mediterranean and the second tallest in Europe, how's that for your bucket list? Check your calendar before arriving, the lighthouse and the museum are open only on weekends and on holidays! Built between 1909 and 1915, the 2200 meter long Corso Italia is one of the main roads in Genoa, connecting the neighborhoods of La Foce and Boccadasse. 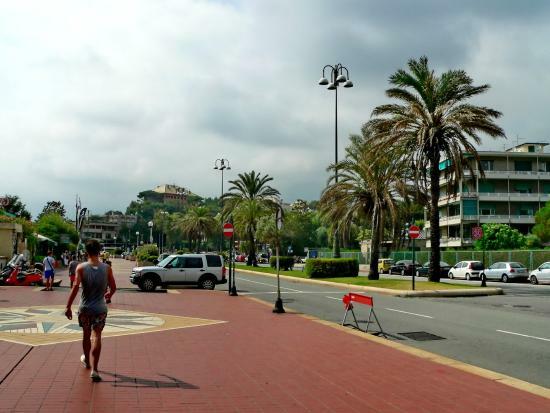 The palm tree lined promenade is loved by the Genoese people and you will see lots of them here, jogging, roller skating, or just enjoying an undisturbed walk. 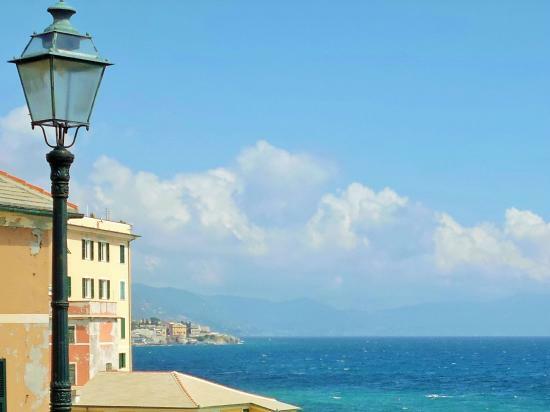 You can start your trip at the Punta Vagno lighthouse in the district of La Foce and end it in the dazzling old mariners' neighborhood of Boccadasse. With a huge capacity of up to 10,000 people, the Nuovo Lido beachfront structure you will notice along the way is the biggest beach resort in Europe. 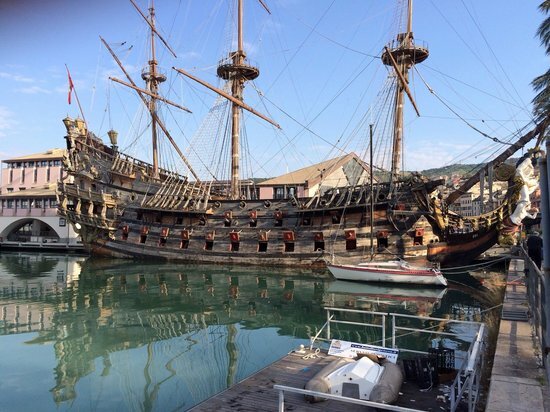 The Genoa Exhibition Center (Fiera di Genova) is in La Foce, at the start of your waterfront journey. It is famous worldwide for reference events in the eclectic boating industry. If you're using a car, a suspended expressway linking the west exit of the A7 highway with the district of La Foce, is worth a drive. You'll be cruising above the city! 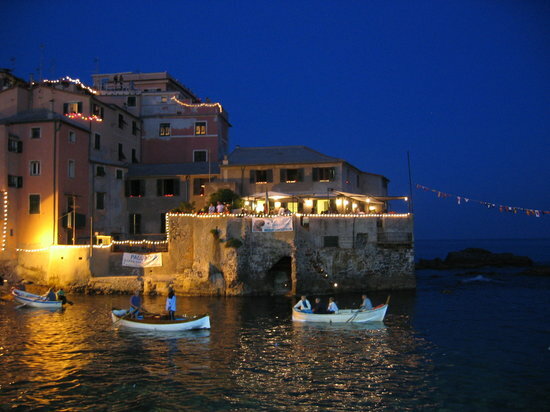 You will arrive in the narrow bay of Boccadasse by walking the distance of Corso Italia from the center. The small bay, in which anchored fishing boats dominate the scene in front of pastel little houses squeezed into one another, is a well-known village where the Genoese and tourists flock to savor the quietness and poetry of a space forgotten by time, in the middle of the modern city. Sit on the rocks, enjoying an ice cream, and listening to the sound of the sea. 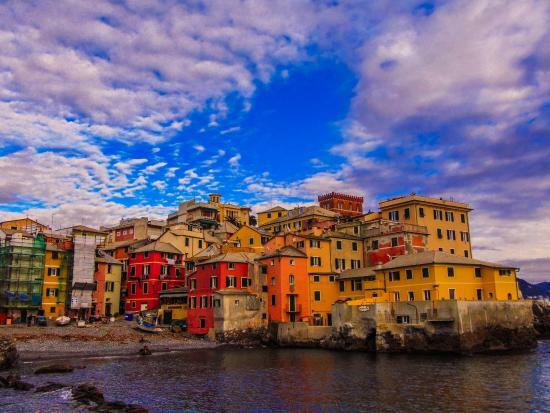 If you don't have enough time to visit the famous Cinque Terre of the Italian Riviera, Boccadasse is the perfect substitute. You don't even need a boat to come here, just walk! 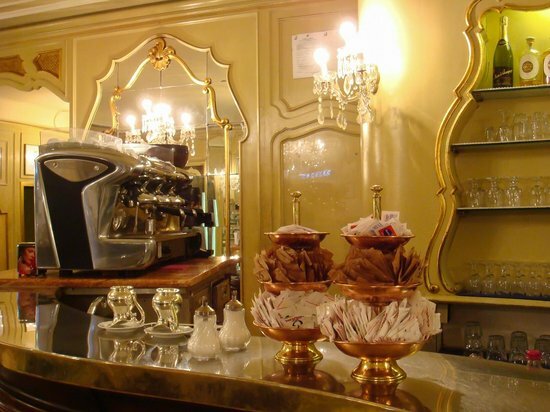 Antica Gelateria Amedeo in Piazza Nettuno 7 is the best place to buy a creamy gelato or a tasty frozen yogurt. A legendary place among the locals since 1927. 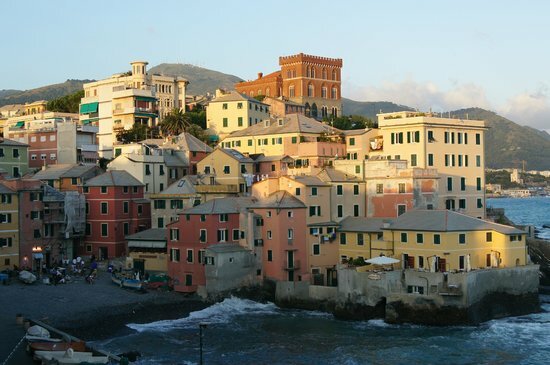 Genoa is sea and mountains, highs and lows, exactly like its cuisine. 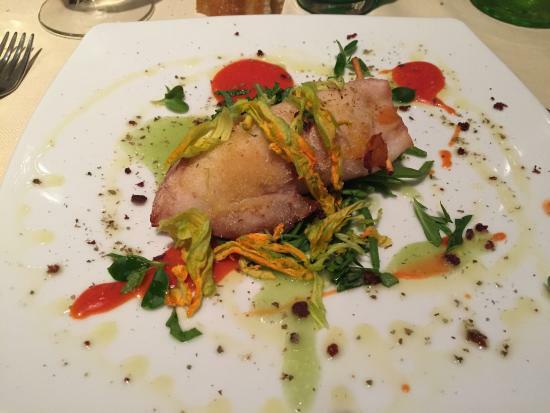 A meal in the Santa Chiara restaurant is a celebration of the culture and lifestyle of the Italian Riviera, where fish occupies an honored place. 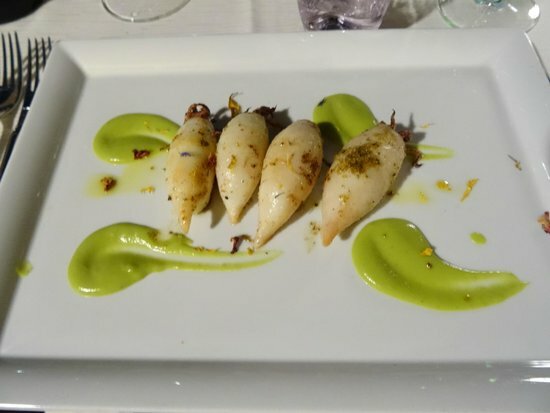 The setting is comfortable and exclusive, perfect for an elegant dinner in front of an arresting vista of the sea, the beach, and the village of Boccadasse . 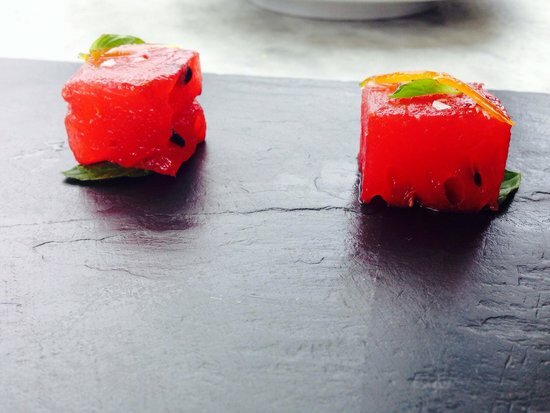 Order the '5 portate' (tasting menu) and let yourself be carried away... By who? By the chef, of course! The wine is included. Order the 'zuppetta imperiale.' It is the chef's specialty, he has been delighting customers with it for quite some time now. There is a special table located right above the sea, an exclusive place to dine. Call to make a booking and maybe you will be the lucky ones! There is a place in Genoa where my pores shimmer under a wavering light, where my thoughts drift to and fro above the sea currents, as I give my feet a rest and face the inexhaustible horizon. 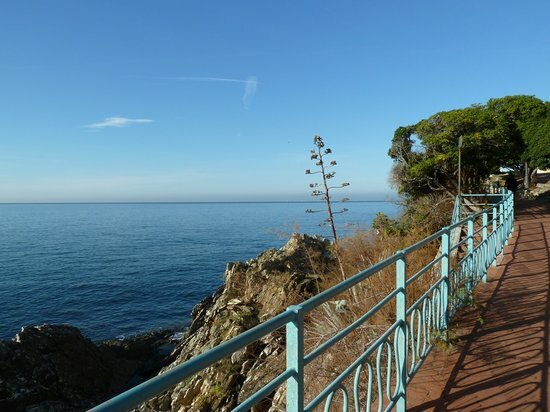 This place is a two kilometer long promenade overlooking the sea, precisely between the Parks of Nervi and the sea, situated in the residential district of Genoa Nervi — heading East from the center of Genoa. The utterly romantic walkway was built taking advantage of the paths along the coast already used by fishermen and farmers, and is endowed with the powerful quality of giving you goosebumps. The steps leading down the cliffs will also guide you towards a few beach resorts. 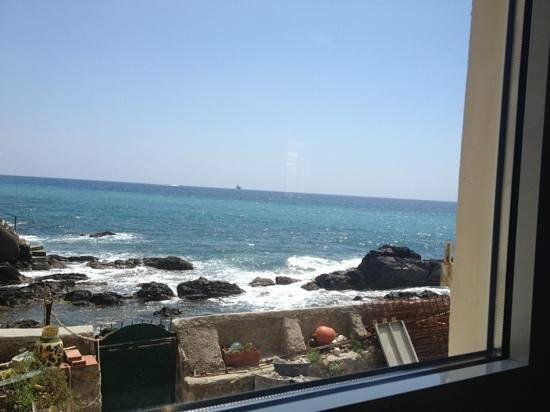 One of them, Bagni Medusa, offers an excellent restaurant in an unspoiled setting. The walking area is dedicated to Anita Garibaldi, wife of Giuseppe Garibaldi — the hero of the Italian Risorgimento . 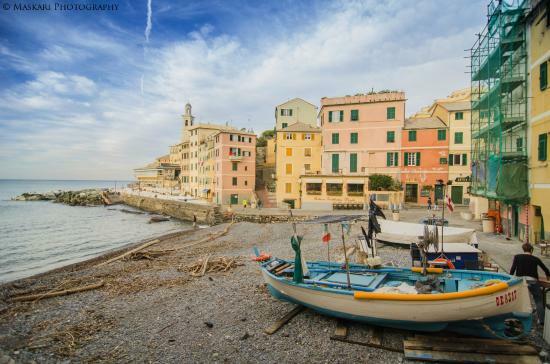 The tour starts near the port of Nervi, an area I advise you to visit for its charming anchored boats (similar to Boccadasse) and its small-scale cozy beach. 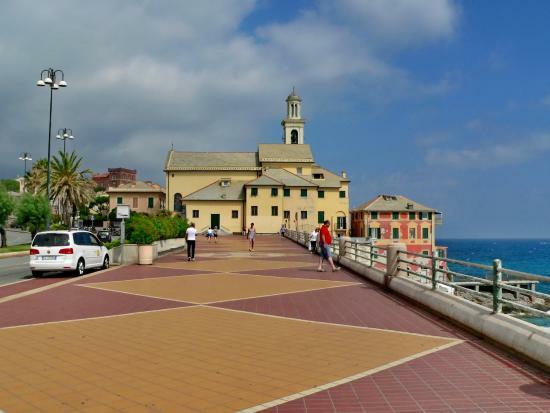 The Nervi parks are surely worth a visit, you are about to see the greatest urban park of the Mediterranean. And the squirrels playing around are just the icing on the cake! 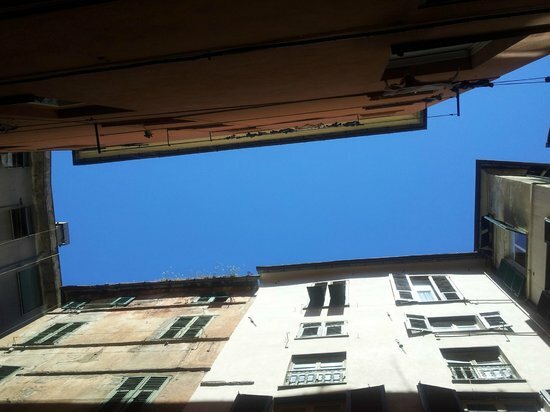 Genoa is, in many of its parts, a quest of verticality. The best way to counter this and to get from the busy core of the city to a blissfully placid paradise 300 meters above sea level, is the cable car Zecca - Righi. 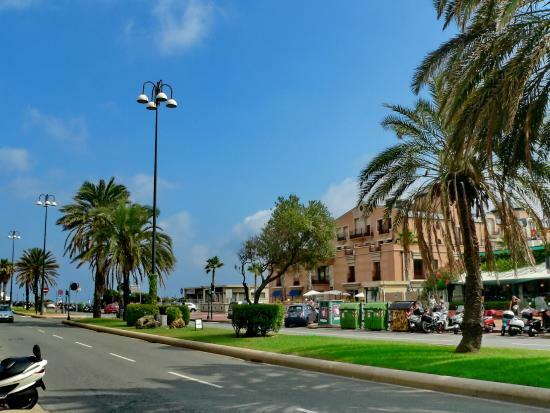 It connects the Largo della Zecca, a square in the heart of the historical center, very close to Via Garibaldi and the museums in Strada Nuova, to the hilly district of Righi. There is only one binary that splits up halfway through, more precisely in the station of St. Nicholas, only to allow the simultaneous passage of the ascending cabin and the descending one. The complete trip takes around 12 minutes for a total of 7 stations. There is a cable car every 15 minutes. This little structure carries an average of one million passengers annually. 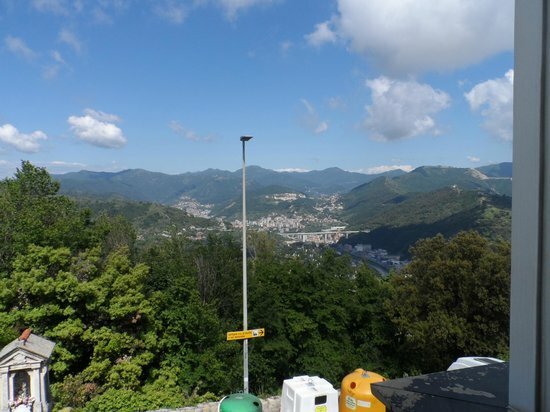 The mountain station of Righi is the place where Parco delle Mura starts: different paths lead to the 17th century walls and to the old defensive fortifications of Genoa. Righi is home of the small but pretty Astronomical Observatory. Look up, the sky is awake! The name Righi is not the real name of the hill: initially called Chiappe, in the beginning of the 1900s, it took the name of a historical restaurant that is no longer there today. Apart from the cable car, the hill of Righi can be reached with buses number 36, 39, 40, 64, 375, and 377. 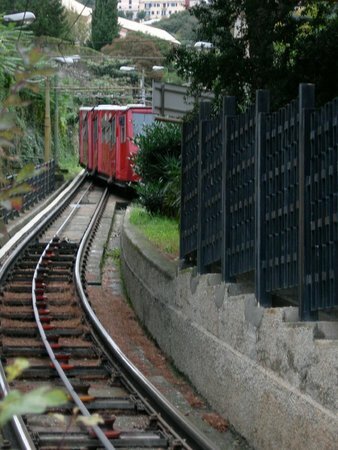 Genoa has a second cable car called Funicolare Sant'Anna. However, this one is shorter than her sister and is used mainly by locals strictly for transportation purposes. Ernest Hemingway described this open-air museum as 'one of the wonders of the world' after walking along its monumental arcades. 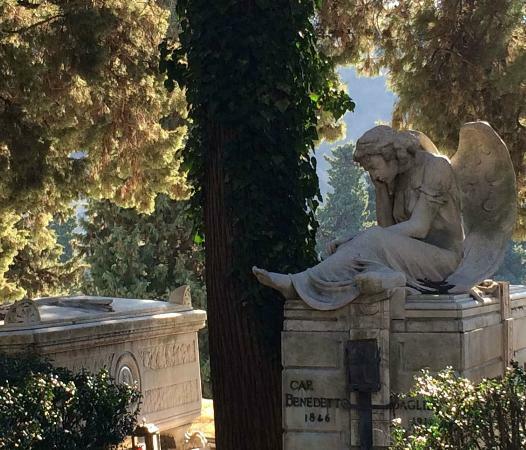 Reputed to be one of the most important cemeteries in Europe, the burial ground is located in the Val Bisagno, a district of Genoa close to the mountains just behind the city. 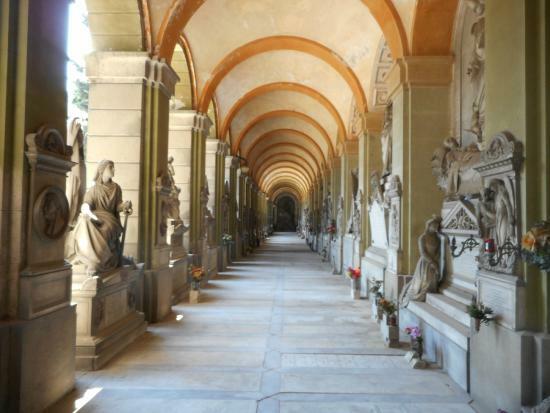 There are beautiful examples of various architectural styles (Gothic, Art Nouveau, Byzantine, neo-classical,) monuments with which the Genoese bourgeoisie of the 1800s flaunted their wealth by honoring their dead at the same time. In addition to the Christian cemetery, the graveyard also houses an English cemetery, a Jewish one, and a Protestant one. The cemetery is open every day from 7.30am until 5.30pm. If you wish to reach the place by car, you should know it's close to the Genoa East exit of the A12 (Genova - Livorno) motorway. Incredibly enough, there is a bus service inside the cemetery. Just imagine the size of this place! 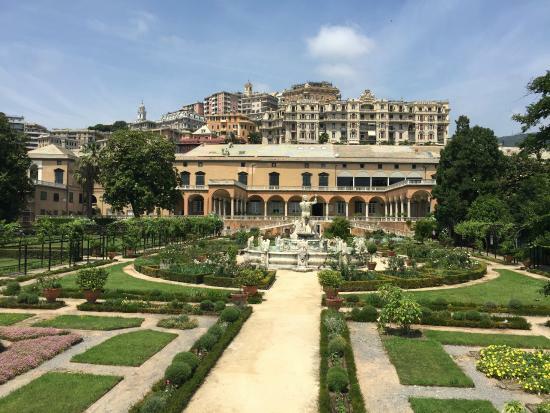 Whether you are looking for the ultimate food-shopping-experience, a delicious lunch break menu, a sumptuous dinner, or just a snack, this should be your next stop in Genoa. A food boutique with a wide variety of excellent local products that are likely to transform your Italian trip into an exquisite gastronomical experience. Eataly is a sophisticated supermarket, marketplace, and modish restaurant with an atmosphere that is both elegant and relaxed. 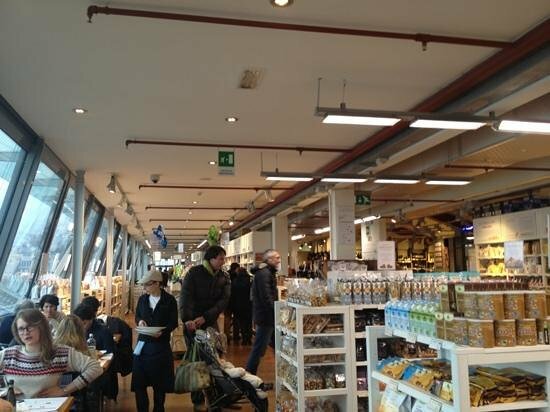 In addition to food and drink, Eataly Genova also offers a selection of kitchen utensils, high-quality household items, and natural products for body and home care. The 'Il Marin' inside allows guests to eat, while enjoying a splendid view of the Old Port, the Bigo, and the entire beautiful portion of the Gulf of Genoa below. The exclusive panoramic window of Il Marin is signed Renzo Piano. That's pure Italian class!